Located on the west coast of the country, a holiday destination for those who like the Baltic Sea air, Haapsalu was the home for the recent 2017 Estonia Junior and Cadet Open. Play commenced on Friday 17th November, concluding two days later on Sunday 19th November. Overall 99 players took part; the Junior Boys’ Singles event attracted 35 competitors, for the counterpart Junior Girls’ Singles competition, a total 17 entries were received. Meanwhile, 29 players competed in the Cadet Boys’ Singles event, for the Cadet Girls’ Singles gathering the number in question was 18 in total. In addition to Estonia, the national associations represented were Denmark, Finland, Latvia and Sweden. Furthermore, there was notable success for the hosts, with pride of place going to Karina Grigorjan; she won both the Junior Girls’ Singles and Cadet Girls’ Singles titles. Impressively, she secured Junior Girls’ Singles gold beating colleagues Reelica Hanson (13-11, 13-11, 11-8) and Kristiina Andrejeva (11-5, 15-13, 7-11, 2-11, 11-9) in the latter stages in addition to securing the Cadet Girls’ Singles title emerging victorious in hard fought encounter. At the semi-final stage of the Cadet Girls’ Singles event, she beat Anastassia Melnikova also from Estonia (14-12, 10-12,11-9, 6-11, 11-8) prior to securing the title at the final expense if Denark’s Jocefina Haagensen (5-11, 11-7, 8-11, 11-7, 11-6). In the penultimate round Jocefina Haagensen had beaten Estonia’s Alina Jagnenkova. Meanwhile, in the Junior Boys’ Singles event it was gold, silver and bronze for Sweden; they provided all four semi-finalists. Edward Wesshagen emerged the successful player beating Filip Norden in the semi-final round (8-11, 11-7, 5-11, 13-11, 11-7) and Daniel Lindsö in the final (11-8, 13-11, 11-9). In the counterpart penultimate round engagement Daniel Lindsö had overcome Eliot Lundqvist (15-13, 11-9, 11-9). 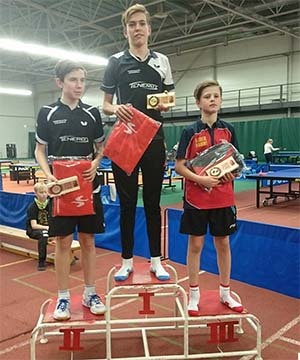 Success for Sweden, in the Cadet Boys’ Singles event it was success for Denmark; an all Danish final witnessed victory for Niels-Anton Tybirk Le Marc. He beat Noah Tolstrup Hvid (11-9, 11-5, 11-7). Earlier in the penultimate round, the Danes had accounted for Swedish adversaries; Niels-Anton Tybirk Le Marc had prevailed against Daniel Lindsö (11-8, 11-8, 12-14, 6-11, 11-7), Noah Tolstrup Hvid had accounted for Dennis Larsson.